I recall on Sunday, March 5, the "Modi-Modi" chant at Varanasi's Pandeypur from a sea of saffron-capped heads wasn't abating. Every minute, in groups, people with BJP flags in their hands would join the swelling gathering. The BJP had prepared for the PM's Road Show Number Two in Varanasi in as many days. Campaigning was to end the next day. The PM had arrived in an SUV with a sunroof large enough for him to emerge, waving at the crowds. The organisers were ensuring a steady supply of the flowers grown in vast stretches of the city's lifeline - the Ganga. The second road show was a sign that the PM had seriously deepened his campaign footprint. Rivals claimed this was because the PM's party was losing and was jittery. There is a huge slice of truth in what the opposition said. After the first two (of seven) phases, leaders below PM Modi and Amit Shah's pay grade were nervous. I am sure even the top duo must have greyed, preparing and fighting for UP. Mulayam, Mayawati and even Akhilesh Yadav are now veterans of UP assembly polls. Modi-Shah may have won 71 seats in 2014, but this is their first UP assembly poll-which, like the Everest, can be climbed, but the climb is a back-breaking test of nerves. PM Narendra Modi held two road shows in Varansi ahead of the last phase of elections in Uttar Pradesh. I have known politicians for a long time, and every five years, they fear the days when the public has the key to their future. Akhilesh Yadav targeted the PM for his twin road shows, but he feared losing his cycle symbol. He took away the post of President from his party's founder-father, partly out of fear. His father had negotiated an alliance with the Congress in the past for Lok Sabha. Nothing ever materialised as stingy Mulayam didn't offer the Grand Old Party a "respectable number of seats." Akhilesh gave the Congress 105 - call it strategy, but it has an element of political fear. Mayawati gave nearly 100 seats to Muslims and to get a few more minority votes, inducted mafia don Mukhtar Ansari. By the time the UP election reached Phase 4, BJP leaders even off the record were speaking unabashedly about a "clean sweep" and poorna bahumat (absolute majority). They brushed aside reports of Jats drifting away in Western UP, the impact of the SP-Congress alliance, and voter turnout of less than 60 percent. But the task for the BJP was Herculean. 2014 was big, but it can't be the point of reference in this election. Then, the janta was voting against the Congress and anyone who could help the BJP come to power. The SP and BSP were routed. They won 5 seats and none, respectively; the Congress got just 2. Muslims as a social group were made redundant. Not a single Muslim won. UP voters chose Modi. The yardstick thus was not 2014 but 2012. The Akhilesh-Congress alliance by 2012 standards was formidable on paper. The BJP had to move from 55 to 203 to form a government. 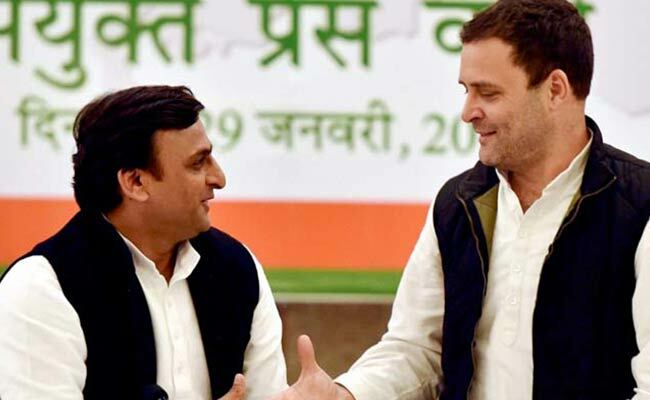 Congress and Samajwadi Party had announced their alliance on January 22. The PM took a huge risk. For a leader who was drubbed in two state assembly polls - Delhi and Bihar - it was an unusual gamble. There are leaders who have avoided taking such a plunge, especially when the battle was tougher than any other in the past. Coincidentally, leading the campaign was the second risk he was taking in three months after the abrupt November 8 demonetisation move. I don't think any Prime Minister before or after Indira Gandhi has tried to unleash such tectonics ahead of polls. Holding two road shows in two days on Varanasi's streets, and two public rallies in as many days, the PM indicated not just that he is battling for prestige in this area, but also that he was risking his face, his status as BJP poll-winner in a tough-to-win election. The PM and Amit Shah had started creating a plan for UP long ago with region-specific policies and initiatives. For example, one of the most successful and "swing-inducing policies" launched by the Modi government - the Ujjwala Yojna or free gas connections for the poor - was launched in Ballia in Eastern UP, - where per capital income in some areas is even lower than in drought - and poverty - stricken Bundelkhand. The scheme is immensely popular among women who got the connections and those who are waiting to get it, perhaps because having gas-driven smokeless cooking systems was never an aspiration poor women could afford here. The PM and Amit Shah, I am sure, had the map of UP, the report on castes generated by the last census - kept secret by the government - in front of them to realise that there was a huge chunk of untapped votes in UP. The BJP after its 17,000 public meetings Parivartan Yatra had provided enough feedback. The plan was crafted to thread an electoral patchwork quilt with 10 per cent non Jatavs (Jatav Dalits are loyal to Mayawati), 10 per cent Non Yadav Other Backward Castes (Yadavs are loyal to the SP) and 20 per cent Most Backward Castes. There have been feeble inconsistent attempts in the past to harness Most Backward Caste or MBC votes in the past. Mayawati had promoted Kushwahas and Mauryas (both belong to the MBC category). Mulayam Yadav was not being gimmicky when he lifted an ex-dacoit, Phoolan Devi, from Bundelkhand's Jalaun district and fielded her from eastern UP's Mirzapur area. Phoolan Devi was a Mallah (boatman caste). That was his signal to the Mallahs who either as Binds or Nishads or Kevats have at least one lakh votes. But despite realising their importance, Mulayam and Mayawati came up with no long-term deep plan to harness the MBC vote. Nitish Kumar's success in Bihar largely due to the MBC or EBC vote (Extremely Backward Caste) was a concrete pointer for the BJP. So it went after them. The track record of the Mulayam and Mayawati governments helped them with the perception among these social layers that Mulayam Raj meant rule of Yadav, and Mayawati in power meant Jatav dominance. The BJP in the past has experimented with a combo of OBC plus its upper caste core base. Kalyan Singh may have risen in the wake of the Mandir Wave, but he was from the Lodh caste. In the 90s, the upper caste, especially the Brahminical grip over the party due to leaders like Atal Bihari Vajpayee, was very strong. Constant friction between second-rung leaders boiled over into a Vajpayee vs Kalyan Singh tussle. Vajpayee was larger than life - Kalyan lost and left the party. Coincidentally, Uma Bharti, another Lodh, lost a similar battle and left the party. The backward castes drifted away. And the BJP's upper caste vote was depleted by frequent tie-ups with the BSP. The BJP slid from power to 55 seats in 2012. PM Modi and Amit Shah had started creating a plan for UP long ago with region-specific policies and initiatives. During its brainstorming, the BJP had clear input that the biggest advantage with chasing the MBC vote was that these groups do not have a history of friction with the upper caste. Eyeing a delicate balance between the poorest and the most dominant, the BJP dropped plans to field someone as Chief Minister, as picking member of one caste could signal a tilt and alienate others. The social friction between castes in UP also has benefits. The BJP assessed that non-Jatav Scheduled Castes (barber and others) and Non-Yadav OBCs (Kurmis, Lodhs and Bhumihar) too were searching for socio-political space. 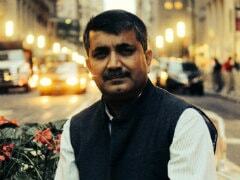 The BJP started by making Keshav Prasad Maurya, a MBC, the head of its unit in the state. The party under him last year carried out a Parivartan Yatra during which it organised 201 sammellans or seminars specifically for the backward castes. During the campaign, the BJP turned the light towards the PM, not merely because he represents strident Hindutva, but also because he belongs to the Teli caste - an MBC in Uttar Pradesh. The BJP didn't talk about this in speeches, though its subterranean campaign emphasised that if the party were operating a blend of Mandal and Kamandal (Backward Caste and Hindutva) campaign, the PM was the perfect mascot. The BJP geo-positioned the presence of each of the 70 castes which are listed in the MBC category. It set up a call centre for 1.38 lakh booths for two-way interaction - the campaign reaching the last voter and voters' feedback reaching the party. Every booth level was added to a WhatsApp group. Amit Shah, with scientific caste data, created permutations and combinations for each constituency. This was best depicted by the selection of candidates and a campaign guidebook distributed by the party to each candidate with constituency-specific issues and tactics. The BJP faced a lot of criticism for importing turncoats from the SP, the BSP and the Congress. The party spokesmen could offer little in defence beyond the usual rhetorics. Not all, but many turncoats were inducted because for many constituencies, the BJP, which had been out of power for 14 years, didn't have leaders who represented the caste balance which the party felt was most suitable. Each seat was dissected. Ticket distribution was a tedious job. For example, in Azamgarh, an SP stronghold with sizeable Muslim population, the BJP fielded candidates from eight different castes, one each from the Vishwakarma, Brahmin, Rajput, Yadav, Nishad, Rajbhar, Bhumihar and Dalits. 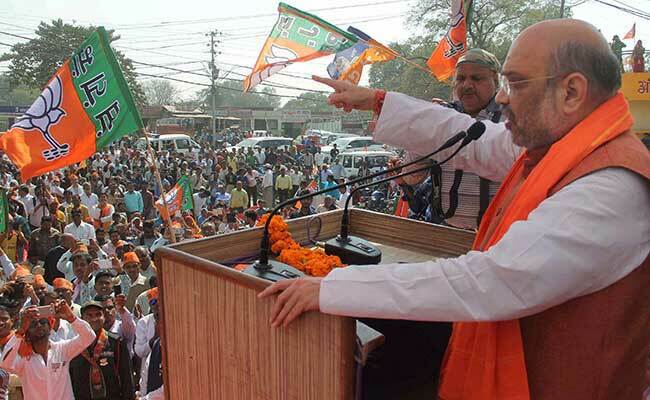 BJP chief Amit Shah at an election rally in Allahabad. The Suit-Boot Sarkar jibe hurt the BJP, PM and alerted the RSS. Since the Bihar loss, the Sangh has nudged the BJP towards shedding its pro-corporate and bania (trader) party image. From then, the policies unveiled by the BJP have one common factor - concern for the poor and farmers. The party's post-poll assessment is that it is the poor who have eventually ended up backing the demonetisation drive. It's a new constituency of voters which include sections of Dalits, OBCs and MBCs - all wooed by the BJP. But the BJP knew the MBC numbers in all 403 constituencies are not decisive. And there is no precedent of these diverse groups getting together to form a rainbow social coalition across the state. The BJP needed some glue to get them together. That came from the subtle communal additions to the campaign. 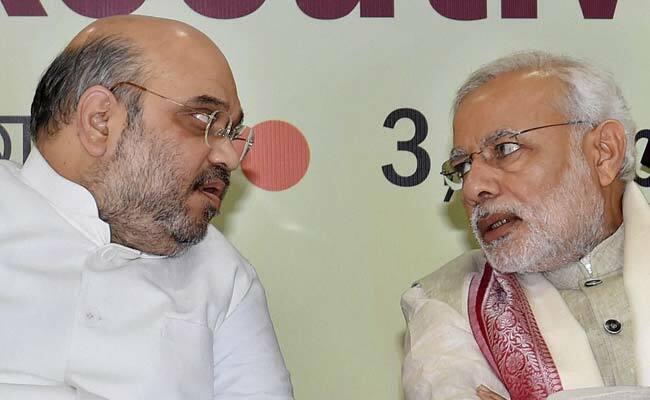 There too, the Modi-Shah duo and RSS provided a new tweak. From the late 80s onwards, the BJP chased the Ram Temple theme to create a Hindu monolith to beat the consolidation by minorities against it. Failure to push the Mandir agenda displeased the upper caste. In 2007, Brahmins, the core of the BJP's ideological and electoral core, dumped the saffron party and voted for the BSP with Dalits and Muslims. The BJP edged the Ram Temple promise to page 24 of its 2014 manifesto. The 2017 poll promise book had the BJP's new polarizers. It talks of a ban on illegal slaughter houses, triple talaq and the migration of Hindus from Muslim-dominated regions. Now a temple has to be made. Failure to deliver tangible results causes disappointment. But the new divisive elements one, rattle the Muslims and two, don't turn failed promises. The biases in electricity distribution, the Diwali-Ramzan power issue, the Kabristan-Shamshan charge are day-to-day issues that don't make communities clash with each other, but promote suspicion. Suspicion which can fuel a divide. A divide which can be politically exploited. The second shift too is subtle. The BJP more or less has stopped espousing issues that provoke the minority. Ram Temple represented an immediate confrontation as it involves building a temple where the Babri Mosque stood. Instead of polarizing, the BJP now prefers counter-polarisation. The SP-Congress alliance, for example, was forged for a Muslim vote consolidation by using PM Modi as the axis. The BSP was no different. The BJP milked it. Subtly. This had worked for the BJP in 2014. Remember the Ram Mandir issue was virtually buried. The PM in his Ayodhya rally in 2014 didn't even mention a Ram Temple promise. But the Muzaffarnagar riots of 2013 provided fertile ground for a sort of polarisation which doesn't turn into a millstone around the party's neck. Sangh insiders admit that the UP experiment of 2017 is not a short-term plan. They say the idea is to re-dress the BJP in a new attire ahead of the 2019 general election. "On paper, the caste bouquet that the BJP has tried putting together is the most diverse and largest ever. A win or loss will be decided not by what we have, but how we generated an atmosphere compelling enough for these sections to unite and head to the polling booths to vote for the BJP," said a source. That's why there is a lot at stake for PM Modi and Amit Shah. If its combinations click, the lotus will bloom in Lucknow after a 14-year gap, and that may mean that in 2019, PM Modi could become the first non-Congress Prime Minister to retain power.